WASHINGTON – President Obama this year alone has fired some nine generals and flag officers, on top of at least four similar dismissals during his first term, suggesting that a purge may be the real reason behind the removals, which are being described as cases of personal misbehavior. Retired U.S. Army Maj. Gen. Paul Vallely, an outspoken critic of the Obama administration, claims it is part of Obama’s strategy to reduce U.S. standing worldwide. “Obama is intentionally weakening and gutting our military, Pentagon and reducing us as a superpower, and anyone in the ranks who disagrees or speaks out is being purged,” he charged. Duty personnel seem to back up this concern, suggesting that the firings are meant to send a message to “young officers down through the ranks” not to criticize the president or White House politics. “They are purging everyone, and if you want to keep your job, just keep your mouth shut,” one source said. The military is looked upon as one of the last bastions of conservative ideas, even though under the Obama administration, it, too, has become a testing ground for social experimentation. The efforts include openly homosexual behavior and women in combat. Three of the nine firings just this year were linked to the controversy surrounding the Sept. 11, 2012, attack on the U.S. special mission in Benghazi, Libya. In one case, U.S. Army Gen. Carter Ham, who commanded U.S. African Command when the consulate was attacked and four Americans were killed, was highly critical of the decision by the State Department not to send in reinforcements. 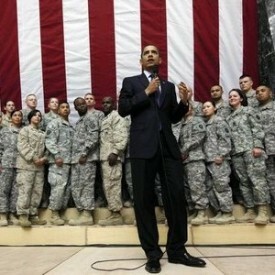 Obama has insisted there were no reinforcements in the area that night. But Ham contends reinforcements could have been sent in time, and he said he never was given a stand-down order. However, others contend that he was given the order but defied it. He was immediately relieved of his command and retired. Another flag officer involved in the Benghazi matter – which remains under congressional investigation – was Rear Adm. Charles Gaouette. He commanded the Carrier Strike Group. Army Major Gen. Ralph Baker was the commander of the Joint Task Force-Horn at Camp Lamar in Djibouti, Africa. Baker contended that attack helicopters could have reached the consulate in time on the night of the attack. He was relieved of his command by Ham for allegedly groping a civilian. However, there has been no assault or sexual misconduct charge filed against him with the military Judge Advocates General’s Office. Six others were removed for a variety of alleged misconduct. Army Brig. Gen. Bryan Roberts, who took command of Fort Jackson in 2011, was relieved of duty and fired for alleged adultery. While the charge remains in the United States Code of Military Justice, it has rarely been used since the days of President Bill Clinton’s affair with Monica Lewinsky. Roberts served in Iraq as commanding officer of the 2nd Brigade Combat Team. He was the deputy commanding general of the U.S. Army Recruiting Command at Fort Knox, Ky.
Marine Corps Maj. Gen. Gregg A. Sturdevant was director of Strategic Planning and Policy for the U.S. Pacific Command. He also was commander of the aviation wing at Camp Bastion, Afghanistan. Sturdevant was a highly decorated Marine with two Naval and Marine Commendations, two Naval and Marine Good Conduct medals and the Air Medal with a gold star. Sturdevant had complained about getting supplies to his command. Yet, he was one of two commanding officers fired from the military for alleged failure to use proper force protection at the camp after 15 Taliban fighters attacked the camp on Sep. 14, 2012, resulting in the deaths of two Marines. Marine Corps Major Gen. Charles M. M. Gurganus was regional commander in the Southwest and I Marine Expeditionary Force in Afghanistan. Gurganus had received the Defense Superior Service Medal, two Legion of Merit with Valor and three Meritorious Service Commendations. His indiscretion? Gurganus questioned having to use Afghan security patrols alongside American patrols after two of his officers were executed at their desk and a platoon was led into an ambush. Army Lt. Gen. David Holmes Huntoon Jr. served as the 58th superintendent of the U.S. Military Academy at West Point, N.Y. While serving in Senior Planning and Education Services, he was “censored” for an investigation into an “improper relationship,” the Defense Department said. Yet, there was no mention on the nature of the improper relationship or whether an actual investigation ever took place. Navy Vice Adm. Tim Giardina was deputy commander of U.S. Strategic Command. He had served as commander of Submarine Group Trident, Submarine Group 9 and 10 where every one of the 18 nuclear submarines with nuclear trident missiles of those three groups came under his command. Among the commendations, Giardina earned six Legions of Merit, two Meritorious Service Medals and two Joint Service Commendation Medals. However, he was removed after coming under criminal investigation for the alleged use of counterfeit gambling chips while playing poker at a western Iowa casino. Air Force Maj. Gen. Michael Carey was commander of the 20th Air Force in which he oversaw almost 10,000 people and 450 intercontinental ballistic missiles at three operational wings. He also served in Operation Iraqi Freedom and Operation Enduring Freedom. He was fired earlier this month for “personal misbehavior,” although no one is saying what that misbehavior was. His dismissal, however, came within 48 hours after Giardina was dismissed. During Obama’s first term, he also oversaw the firing of at least four other generals. Army Gen. David Petraeus, who retired to become the director of the Central Intelligence Agency, was pressured to leave that position after only a few months following allegations of adultery. Gen. John Allen was relieved of duty for “inappropriate communications” with a woman allegedly involved with Petraeus. However, he was promoted to head NATO, but decided to retire. Gen. Stanley McCrystal was fired by Obama for alleged comments he made in a Rolling Stone magazine article. Gen. David McKiernan was removed from his post while commander of the International Security Assistance Force in Afghanistan in 2009. He didn’t go along with a counterinsurgency strategy. He was replaced by McCrystal who did comply. However, Petraeus, who replaced McCrystal, reversed his restrictions on air power. Petraeus then was replaced by Allen, who abandoned counterinsurgency and refocused on training Afghans toward an orderly pullout by U.S. and NATO forces from Afghanistan. F. Michael Maloof, staff writer for WND and G2Bulletin, is a former senior security policy analyst in the office of the secretary of defense.